The String of Pearls had me at Hello. 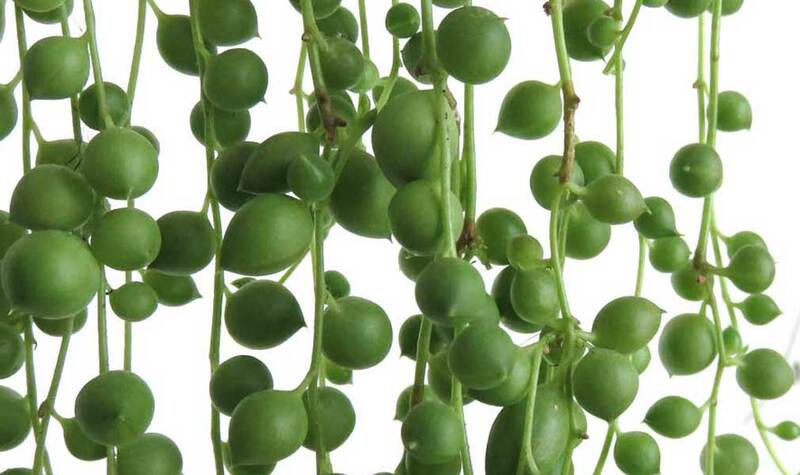 All those perfect little green beads, or pearls, hanging down long, slender stems. 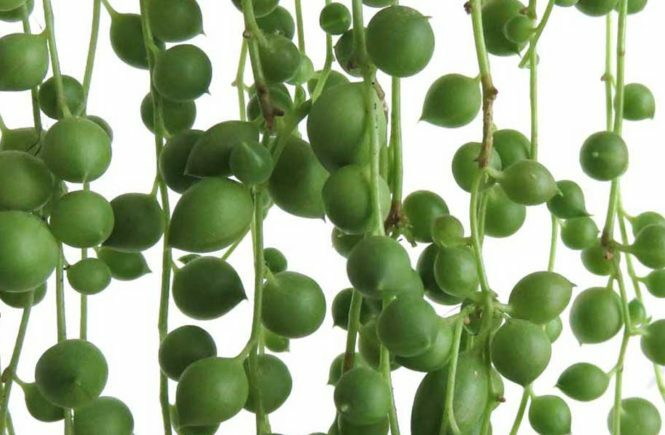 This unusual succulent is formally named Senecio Rowleyanus but is more commonly known as a String of Pearls plant, after the round bead or pearl-like leaves. 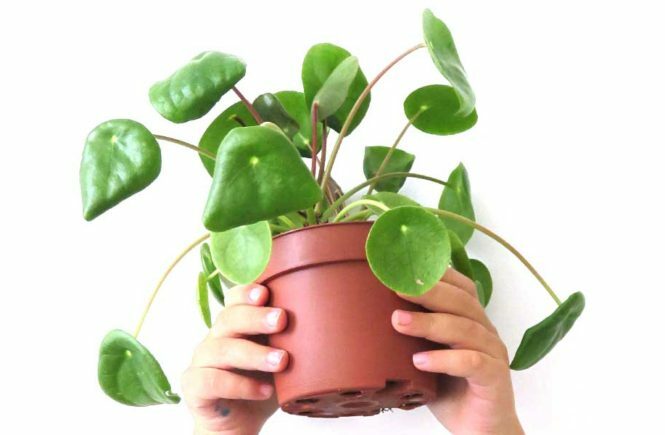 It requires little hands-on care and is super easy to propagate. So how many pearls would you like my dear? A String of Pearls plant can be grown outdoors, but it can also do really well indoors with the correct soil, watering and light situation. 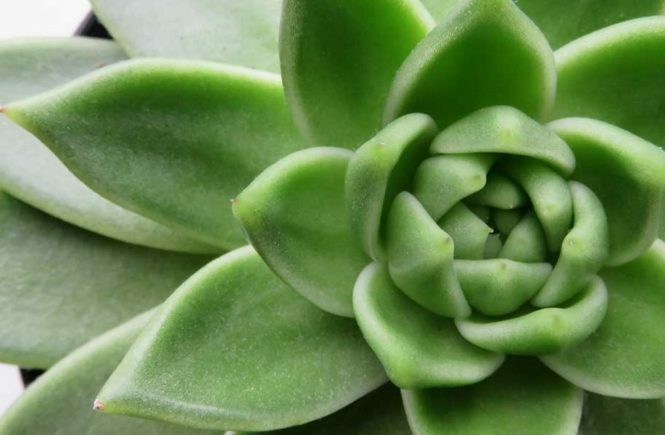 Being a succulent, the pearls store water inside. This is good because it means it can even handle a little neglect. But why would you want to neglect this attention-grabbing plant? Give it the right care and you will be showered in pearls. The String of Pearls plant is very easy to care for. Start out having the basics right, soil, light, and water. Your String of Pearls will grow long and full in no time. The most common reason for a String of Pearls plant to run into problems is root rot, caused by overwatering. So make sure your pearls are in a fast draining succulent potting mix. You can take it a step further, by adding some pumice or perlite to the soil. The Sting of Pearls plant likes a lot of light. It can handle a spot on a sunny window sill. Direct light is ok, but preferably not all day. If you can, give your plant a few hours of direct morning sun, followed by bright, indirect light for the rest of the day. When to water your String of Pearls plant. Look at your pearls. When they start to shrivel, and the soil feels dry, it is time to water. 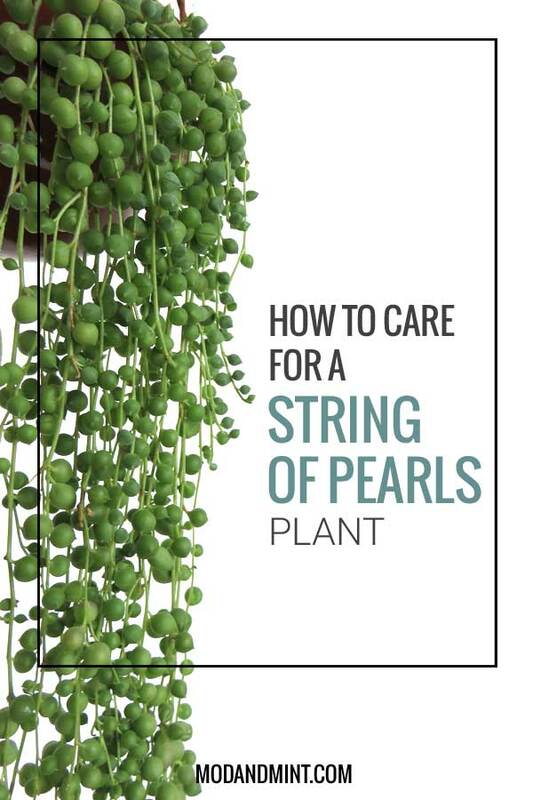 How to water the String of Pearls depends on the season you’re in. During summer the pearls are in their growing mode, water when you notice the soil starts to dry out. In winter the plant is resting. So it needs less water. Water sparingly just enough to moisten the soil. Wait until the soil is nearly dry throughout before you water again. What to do if my String of Pearls plant becomes straggly? It happens. Just cut those straggly stems off. Why is my String of Pearls plant shriveling up? It is perfectly normal to have an occasional pearl shrivel and wilt away. But if there is obviously more going on, start by checking the soil. Is it dry? If it hasn’t been kept too dry for too long, you should be able to revive your plant by giving it a good watering. If you notice shriveling and drying pearls while the soil is still wet or moist, the reason could be that you overwatered your plant, or, if you have just planted the stems, they might not have rooted yet. How to save my String of Pearls plant? If your String of Pearls plant is slowly deteriorating because you have overwatered it, don’t just sit by and watch. Is the String of Pearls plants toxic to pets? Yes, the String of Pearls succulent is considered toxic if ingested. 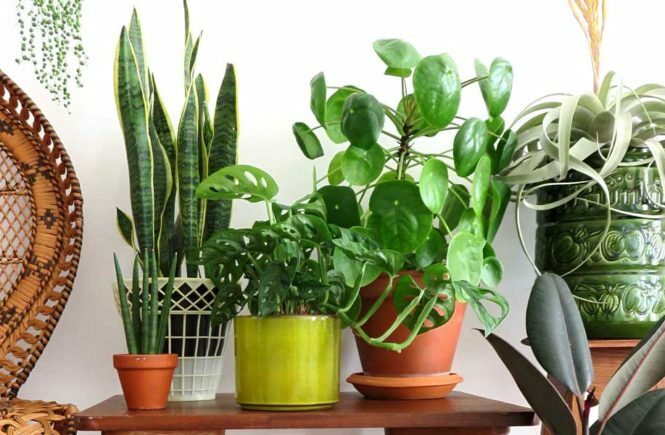 Be sure to keep the plant out of reach of children and pets. READ NEXT: Indoor Plants and Cats. How to keep it safe. 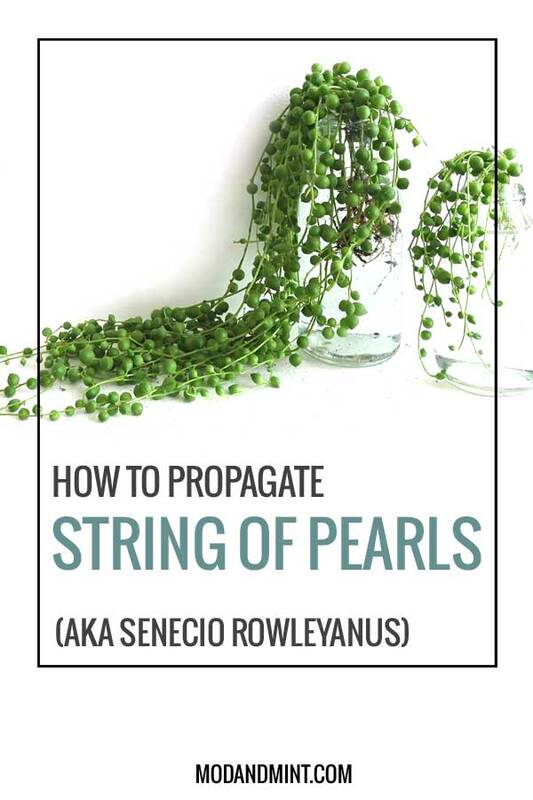 There are a few reasons why you would prune and propagate your String of Pearls. It could be because it’s growing so much and trailing so long, that you have to control the length. Or is has become a little leggy. Maybe you want to share the love and give a cutting to a friend. You can easily start a new String of Pearls plant, or transfer the cuttings back into the original pot to make your plant lusher and fuller. Carefully take your stem cuttings. Make them at least about 4 inches long. Remove a few pearls from the bottom of the cutting. There are two ways to root the String of Pearls cuttings. First, you can water root your pearls. Place the cuttings in a small bottle of water and wait for the roots to grow. This way when you place the cuttings into the soil, roots are already established and the cuttings can start growing in the soil right away. You can also choose to bypass the water rooting and just go straight for rooting in soil. Place your cutting on top of the potting soil, covering the bottom part where you have removed the pearls. Lay the stem so the pearls are on the soil. 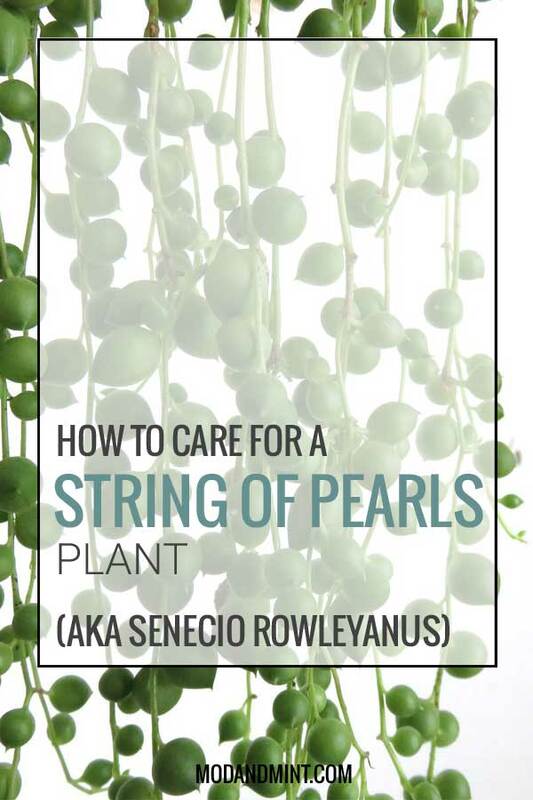 The String of Pearls puts out roots along the stem, so make sure it is in contact with the soil to have it root more quickly. While you wait for roots to establish, water very lightly to prevent overwatering. Moisten only the top of the soil. Your String of Pearls cutting won’t just grow longer, it will also branch out from the entire stem. Before you know it, you’ll have new pearls popping up everywhere. Want your own Pearls? You can get them delivered to you through Amazon or Etsy! First time i have read comprehensive advice on String of pearls, thank you very much. Now I can confidently grow them. I’m glad you found it helpful. Good luck with your String of Pearls! I believe I can follow the care of my setting off pearls with these easy to follow instructions. I am sorry, but I don’t really understand your question. Can you clarify maybe, so I can try and help? I have two cats and was wondering if there was a way for my plant to grow more like a draping bush than long strings, so my cats don’t get tempted by them. I already have two toxic plants that I’ve had for years that they haven’t touched, but they are in pots on tables and grow upward. I’m concerned that if the string of pearls are too long, the dangling pearls may entice them. I would like them to be full with a maximum length of 8 inches to a foot. Do you have any suggestions on how I can do that? Yes, those dangling pearls can really tempt the cats! You can easily just cut your strings when they get too long. Don’t throw those away though. Remove the first couple of pearls and place the strings in a small bottle of water. Once they form new roots, just plant them back into the soil of the original plant. That way you lose some of the length and end up with a fuller bush.